Alaska allows you to complete your divorce without an attorney if you and your spouse can come to an agreement on what to do with your property and how you will care for any children that you have. At least one spouse must currently reside in Alaska, who is physically present in Alaska and intends to remain a resident of Alaska. No minimum days of residency is required. You review and sign the documents, then file the Petition for Dissolution of Marriage and other divorce documents with the court clerk. You then wait 30 days from when the Petition was filed before attending a final hearing. A judge completes your divorce by signing your Decree of Divorce. 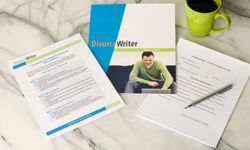 DivorceWriter provides forms specific to the state of Alaska and offers a money back guarantee if your documents are not accepted by the Court. If you select a Alaska divorce with children, you are selecting the non-children forms as well as Child Support Affidavits and Child Support Worksheet(s). You have qualified to use DivorceWriter to complete your Alaska divorce papers online. Select "Continue" to start the interview.